The London 78" double-sink vanity in white is the largest model in our London series.This stylish vanity is sturdily built using solid hardwood for both the frame and the panels. The classic look of the white Carrera marble countertop and the contemporary style of the white cabinet meld to create a design that is both clean and luxurious. The generous storage capacity of this vanity includes two pull-down shelves, nine pullout drawers, and two soft-closing double-door cabinets, all accented with satin nickel hardware. A matching framed mirror and a pair of chrome pop-up drains are also included in this set. 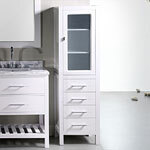 Nine pull out drawers, two soft closing double cabinet doors, satin nickel finish hardware.